It struck me last night as I was watching Ron Paul on CNBC criticize the Federal Reserve's actions that the crowd heretofore referred to as the inflationists are the greatest promoters of the Fed's real agenda. Bernanke has successfully shifted the dialogue in just a few months to one solely focused on the danger of future inflation rather than the deflationary/disinflationary environment we have found ourselves in for quite some time. Bernanke has stated that general consensus among economists (if there is such a thing) and his belief is that a 2% inflation rate is ideal for fulfilling the dual mandate of stable prices and maximum employment. Over the last several years we have battled with deflation which presents the greatest possible worry to the Fed. A deflationary environment is harmful because keeping money in risk-free cash accounts actually makes money when the aggregate price level falls. This curtails the desire to invest as gains are made by assuming no risk. 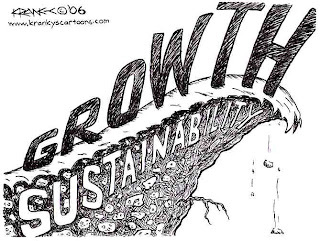 This causes growth to further stagnate. If this positive feedback loop continues uninterrupted the economy can fall into a deflationary spiral, Bernanke's greatest worry after decades of studying the Great Depression. With the FOMC's recent announcement of quantitative easing 2.0 the debate has quickly shifted to the dollar's demise and the imminent onslaught of high inflation rates. The ironic point to be made however is that for every average person that becomes convinced the Fed is stupid and will cause high inflation the closer the Fed gets to accomplishing its goal. The Fed wants to be hated right now! By effecting a rise in the general level of inflation expectations more people will perceive the need to invest and thus cause said inflation. Also, it must be said that the dollar is at exactly the same level it was at the beginning of the year. It rallied and then fell during the year but it is exactly where it was when the clocks rolled over to 2010. The inflationists play right into the Fed's hand. It is very interesting to see so much debate about the assumed consequences of the Fed's actions instead of focusing on the current predicament. The goal of the Fed is to balance the trade off between inflation and employment by adjusting the money supply. Every action it takes in positive goals: taming inflation or promoting employment has effects on the other side of the equation: depressing employment or stoking inflation. At a time when we face a reported unemployment rate of ~10% and inflation sub-2%, the goal should be to pursue expansionary/inflationary monetary policy. While I have been somewhat skeptical of the need for further easing, I understand why the Fed did it and it makes sense. The Fed cannot spurn its obligation to fulfill its dual mandate. I believe fiscal policy is a better option but the Fed would not be satisfying its purpose by sitting on the sidelines. 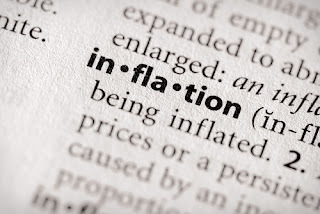 The inflationists point to the rise in commodity price as the clear and convincing evidence that we already have high inflation but is that the case? With several metals at all-time highs and grains in a strong summer rally, the proof is in the pudding, no? Well, commodities are very volatile assets and their supply/demand is affected by a lot more than just US monetary policy. 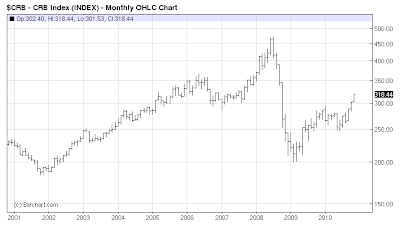 Metals were in a bull move long before 2008 and we certainly cannot ignore the massive wildfires in Russia when looking at grain prices this summer. The most important driver of demand is not liquidity, it is global demand particularly from emerging economies. Assuming the Fed completes the $600 billion in asset purchases over the next year, they will have expanded their balance sheet by roughly $2 trillion throughout this entire recession. This expansion is against the backdrop of approximately $40 trillion in gross domestic production here in the United States. The scale of printing is quite large indeed but it has been done during the worst contraction in the US economy in 80 years. In an attempt to avoid another Great Depression unprecedented action is certainly called for and historical metrics are invalid. For the inflationists, if they're willing to not shoot the messenger on this one, Paul Krugman has two great blog posts succinctly summarizing the commodity inflation story. In his post yesterday he shows that commodity prices are very volatile and milk and gas, two oft-cited consumer needs, are not higher than prices pre-2008 crisis. The chart below shows the CRB Index, the best way of measuring the broad moves in commodity markets. At a glance it is clear that even if the 2008 oil bubble is removed, prices are not even back to the highs in 2006. The global demand story is the driving force behind the secular bull market in commodity prices. Even with the collapse in 2008, the trend is still upward for these markets and will likely continue for the foreseeable future. As Krugman points out today the United States is not the world. Industrial production in emerging markets are the key drivers of demand. The obsessive focus on inflation is unwarranted and it should be recognized that QE 2.0 is having its intended effect of raising inflation expectations. Once we see real inflation, then we'll have to look at the FOMC's response in judging whether they can handle inflation or not.